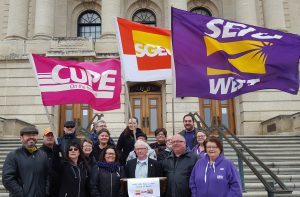 REGINA: Saskatchewan’s three health care provider unions, CUPE, SEIU-West and SGEU, have been working collaboratively to present a proposal to government that would mitigate the impacts on patient, client and resident care while government transitions to one provincial health authority. This proposal calls for a formal bargaining council structure to help stabilize labour relations and negotiate with the new authority. This proposal is not unique, as other health care employers and governments in Canada are in place such as multi-union bargaining councils in British Columbia (since 1998) and in Nova Scotia (since 2015) where health care unions and government agreed to a similar structure. Under the current structure, people accessing health care services have witnessed the results of short staffing in acute, long-term and home care situations. Health care providers have been calling on the government to reinstate safe staffing levels for a decade. No one is confident that moving to one provincial health authority will ease health care providers’ workload or stress. Since the provincial government released its budget on March 22, many questions regarding health care funding remain. How will the actual changes to health care funding, and the additional funds from the federal government, improve the delivery of valuable public health services in Saskatchewan?